On November 28, Tahir Elçi, one of Turkey's most prominent pro-Kurdish lawyers, was holding a press conference close to the very same minaret he referenced in his tweet above, explaining that the people of Turkey's Kurdish-populated East were tired of conflict and recurrent government military operations in the region. Moments after he finished his speech he was shot dead as police and Kurdish militants clashed, with his death prompting thousands to come together for a politically charged funeral in the Kurdish region's administrative capital. “Çatışma istemiyoruz” diye haykırmanın karşılığı ölüm olmamalıydı. 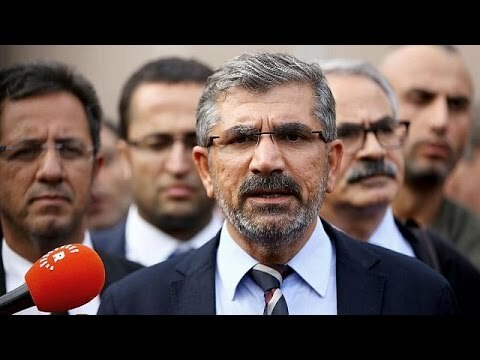 Tahir Elçi'yi ve polisimizi katleden güçler hesap vermelidir. Exclaiming “we do not want violence” should not have resulted in death. The forces who massacred Tahir Elçi and our policemen must give an account of what they have done. But in Turkey's currently toxic political landscape, everybody has a different interpretation of who these ‘forces’ were. The pro-Kurdish left-leaning HDP (People's Democratic Party) characterized Elçi's shooting as a political assassination. Head of Diyarbakir Bar Association Tahir Elçi is viciously murdered by the slayers of law. WE WILL PURSUE YOU! The polarization that has come to typify online responses to Turkey's Kurdish conflict was again in evidence in the aftermath of the shooting. Thousands of tweets were posted under the hashtags #TahirElçi and #TahirElçiÖlümsüzdür (#TahirElçiIsImmortal). Those that do not blame militants from the PKK (Kurdistan Workers Party) for Elçi's death, blame the state. Havuz medyası hedef gösterdi. Savcı gözaltına aldı. Bir tetikçi şakağından vurdu. Vali ise sokağa çıkma yasağı ilan etti. ‘Faili meçhul'? State media made him a target. Prosecutor took him into custody. A marksman shot him through his temple. The governer, moreover, declared a curfew. Unsolved murder? övdüğü pkk tarafından kursuna dizilen. 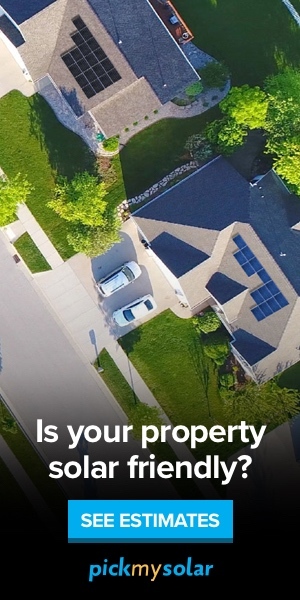 kurşunlar havada uçuşurken pismanlik duymuştur eminim. edit = saldırıda bir de polis şehit olmuş, kürt ırkçısı birinin ölümü konuşulurken, gerçek emekçinin ölümü hiç konusulmuyor. He was executed by the same PKK [Kurdistan Workers’ Party — the main Kurdish militant faction] that he praised. I am sure he was full of regrets as those bullets travelled though the air […] During the attack, one policeman was shot to death. While a Kurdish racist's death is being debated, no one talks about the death of a real worker. Other observers have drawn a parallel with the assassination of Hrant Dink, a high profile ethnic Armenian journalist gunned down in 2007, whose death was never fully solved. Shortly after Elçi's death thousands took to the streets in Diyarbakır as well as Istanbul and İzmir. The gathering of almost 2,000 in Taksim in Istanbul was broken up by tear gas and water cannon. 16:56 #İstiklalStreet, people shout “Thief, murderer AKP”, after the police attack against #TahirElçi protest. Istanbul, Turkey. 28th November 2015 — Protesters run for cover from tear gas fired by Turkish riot police during a demostration on Istiklal avenue in Istanbul after a top Kurdish lawyer was killed in Diyarbakir on November 28, 2015. Demotix image by Avni Kantan. ID: 9171320. The protests reflect growing public frustration at insecurity in Turkey with hundreds of people having died in political violence in the second half of this year. The improvement in relations with the country's Kurdish minority was once hailed as a key achievement of the AKP government. But as AKP seeks to reassert its dominance across the country's political landscape following an electoral victory in November, it has fallen back on nationalist rhetoric while using the PKK threat as a pretext for wide-ranging and oppressive security operations in the country's east. Tahir Elçi was a very successful human rights lawyer, who was the defence lawyer in many important cases such as Lice, Roboski, and Temizöz. He was an important activist who worked for peace between the Kurdish and Turkish communities. Last month, however, he was arrested for declaring that the PKK was not a ‘terrorist organization’. After the arrest, he was released conditionally and banned from traveling abroad. 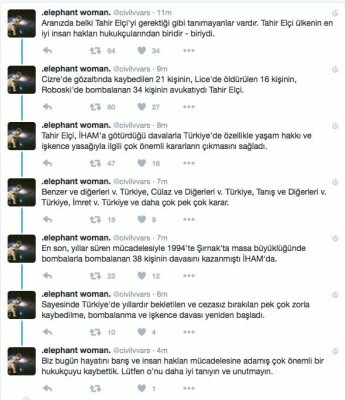 Who is Tahir Elçi: tweets by @civilvvars. There are maybe some of us who did not know Tahir Elçi as we are supposed to. Tahir Elçi is – was – one of the best human rights lawyers of this country. He was the lawyer of 21 people who disappeared in custody in Cizre, 16 people who were killed in Lice, and 34 people who were bombed in Roboski. Tahir Elçi managed to win many important decisions in Human Rights Courts, especially on the topics of the right to live and torture in Turkey…. …Thanks to his efforts, many cases of forced disappearances, bombings and torture that were either kept waiting or left unpunished were recommenced. Today, we have lost a very important lawyer who has given all his life to peace and the human rights struggle. Please get to know him better and do not forget him. 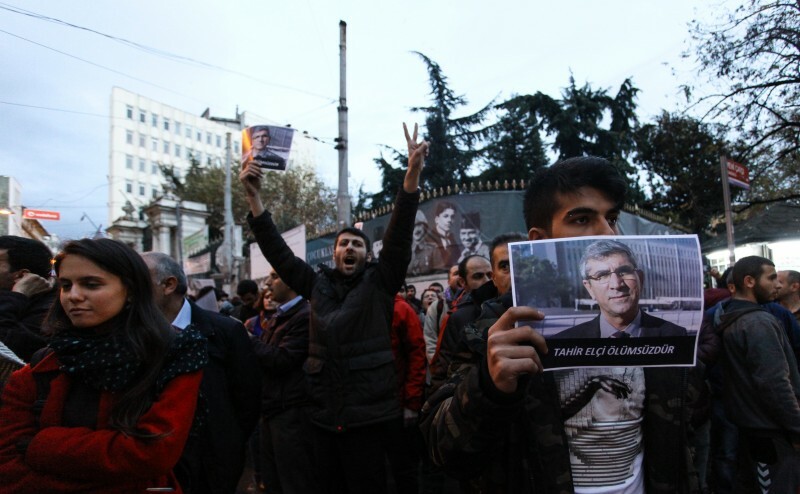 Tahir Elçi's funeral was held on November 29 at Koşuyolu Park, in front of Yaşam Hakkı Anıtı (Statue of the Right to Live) and attended by around 50,000 people. Many more were reportedly blocked from attending due to the cancellation of flights and buses to the region. HDP's co-president Selahattin Demirtaş, the head of Turkey's Bar Association Metin Feyzioğlu, and the bar presidents of 80 different cities and many other political figures attended the funeral. Thousands continue to walk after Elçi's funeral, the public salutes the funeral from everywhere. Tahir's death is not because of the state, but because of the lack of state. There is a state in Ankara, which does not feel this pain. How could you hold a society together, which can not even come together around this pain.